Natural, Organic, Clean…what does all this mean?! By doctor’s orders we have been forced to make solid changes in our diet. I’m actually happy about this! I’ve been trying to get us on a more natural food path for a while (I actually used to be a vegetarian) but have been a bit lazy about it. We have definitely made some small adjustments over the years and were heading in this direction but when your husband’s health is on the line and he is now 100% supportive, the planner in me gets overly excited and jumps on the bandwagon whole heartedly. I’ve started my own research on what it means to eat Clean, what ‘Natural’ means on a food label, if the RAW food diet may be beneficial and how to start eliminating certain foods from our diet. This is no small task and there are TONS of websites, blogs, documentaries and other media full of information out there. At this point I’m not convinced we need to be a RAW family but I will keep you updated as we progress. In the meantime, my husband was given the advice by his M.D. to go on the South Beach Diet. While I’m all for advice from an expert, I’m not a fan of diets for a short period to see immediate results and pass a test. What I personally believe in are healthy habits that last a lifetime. The best part of this lifestyle change for us right now is that we are still fairly young (mid-late 30’s) and much of what we are challenged by is reversible. What I love most is that my children will grow up much more informed than I was. 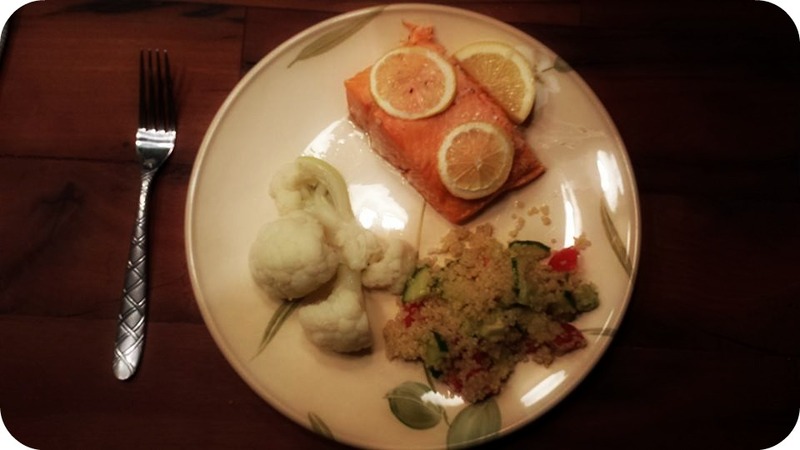 So, last night’s dinner was: Wild Salmon, Organic Cauliflower, Organic Quinoa salad w/tomatoes, cucumber and avocados (all organic). The dressing was made of EEOV, lemon, salt, pepper & garlic (again, all organic). It was yummy and got me excited to keep going with not just ‘healthy’ recipes but more Clean and Organic recipes. Oh, and forgot to mention, normal portion are another healthy habit to keep!